There are more robotic toys crawling out of the woodwork this weekend than you can shake a stick at. 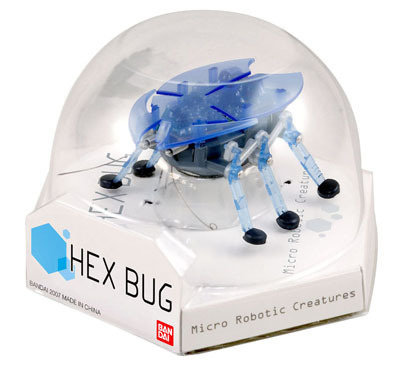 The Bandai Hex Bug is a robot insect toy from Japan that moves and acts like a crawling bug and reacts to sound and touch, and will bring back memories for those who recall the Bandai Wonderborg. The Wonderborg was a little too big for cats to be interested in, but the Hex bug looks just small and jittery enough to possibly be the perfect cat toy. The Bandai Hex Bug is available now at AudioCubes in five different flavor..err, colors. Video after the jump.